The season is upon us and we aren't talking about the holidays. It's the most magical time of the year, when so many couples get engaged! 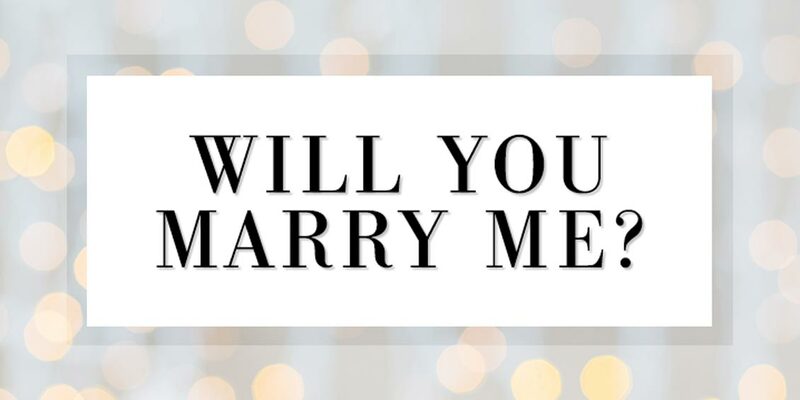 To get in the spirit of "proposal season" we wanted to share some romantic and unique proposal ideas that every girl (or guy) would say yes to. Getting down on one knee and asking for your partner's hand in marriage is a magical moment on it's own. However, we know that now a days, it's all about the "wow" factor and those insta-worthy moments. So, to help create an unforgettable proposal for your other half, we've put together a list of unique ways and ideas to make it EXTRA special. Adding personal touches to your proposal is always a great idea. Whether this means having your favourite song playing in the background, or popping the question at the restaurant you had your first date. Personal touches go a long way and we are sure that they won't go unnoticed. Propose in a way that is unique and special for you as a couple. That could include a slideshow of pictures from when you first started dating to the present, or putting together a scrapbook of all your memories together as a couple. Whatever you choose, just make sure it relates to the both of you and is something that you both will appreciate. Catching the person off guard is the best way to propose in our eyes. We know some (or most) people say they don't like surprises, but for a special moment like a proposal, keeping it to yourself until the big question makes it SO much better. We're not saying catch your other half at a bad time, when they're coming home from work and have been texting you all day saying what a horrible day they had. Do it when they're least expecting it, but you know they would say yes (that's very important!). 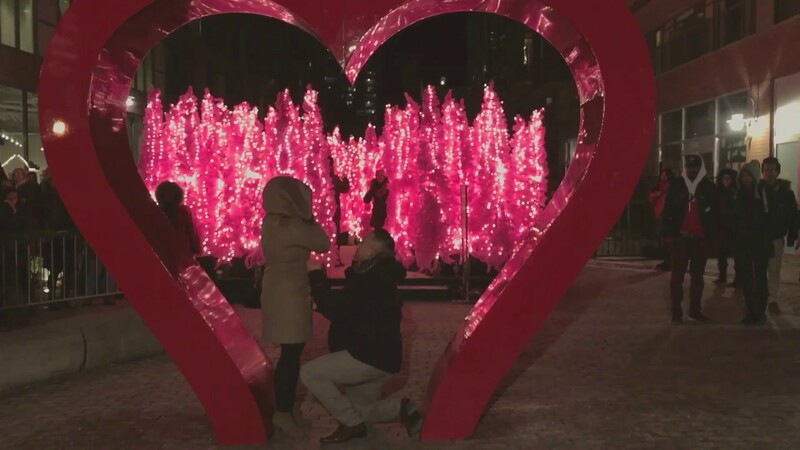 The proposal can be something small, at your house, on a weekday over a home cooked meal and a nice glass of wine OR you can splurge a bit with a weekend away, maybe Niagara-on-the-Lake and propose by the falls. 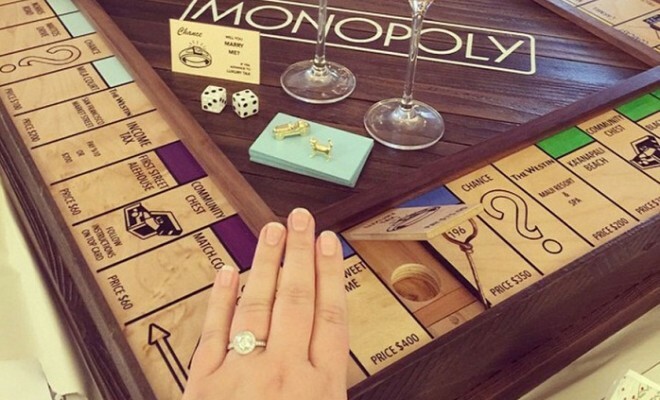 Think outside the box when it comes to asking the one you love to marry you. 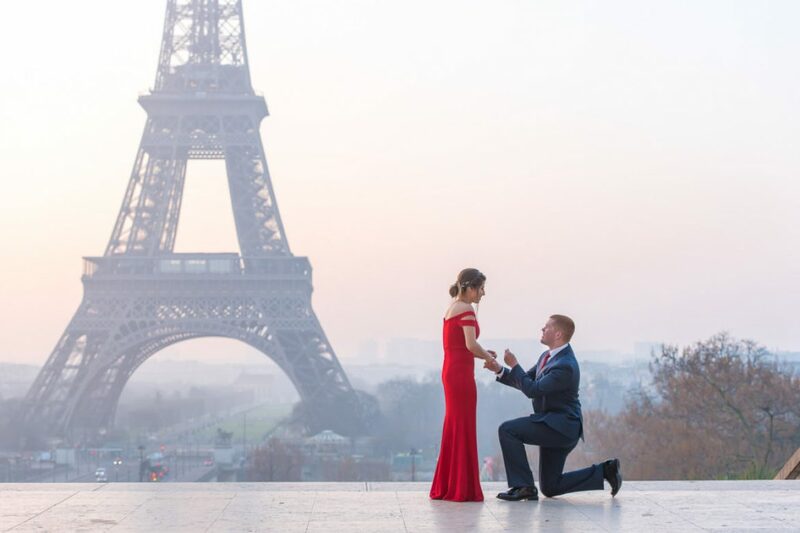 Everyone loves sharing their proposal story, and will be even more excited if there's a good story to tell, right? Create a magical moment that is special for you as a couple, not something that worked for your friends. 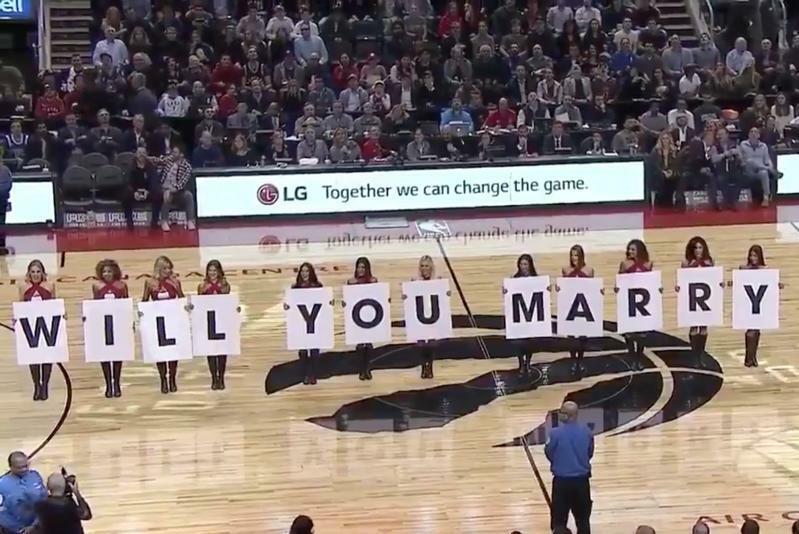 If you are big sports fans, why not pop the question at a Toronto Raptor's game during half time? Maybe have the question on the jumbo tron. When it comes down to the big moment and getting down on one knee, saying the words may not come out because emotions will be flying high. Our suggestion is to write down what you want to say and practice it a few times, so your nerves won't get the best of you and go blank when the time comes. You may feel a bit weird rehearsing your proposal moment, but it will definitely be worth it when you don't stumble on your words when the time comes. 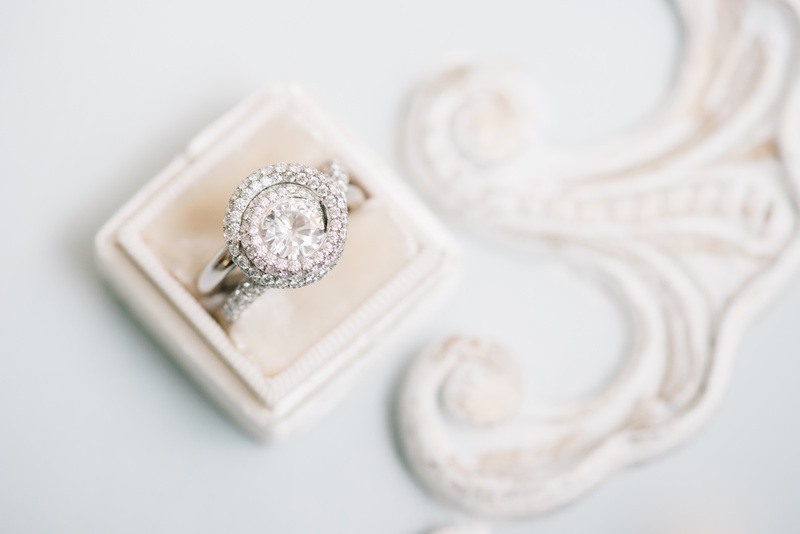 After you decide on how you will pop the big question, maybe you want to capture the special moment, so you will forever remember such a memorable moment. Hiring a photographer may sound like a bit much, but it's becoming more popular and it really is a nice added touch. We suggest having the photographer for a couple hours, so they can capture the actual proposal, then grab some pictures after it happens as you celebrate as a newly engaged couple. If you really want to go all out, then consider hiring a videographer as well. here are 21 fun and unique ideas that might just be the way to your partner's heart. With Christmas being next month, how perfect, and not to mention super romantic, would it be to spell out "Marry Me" in lights. 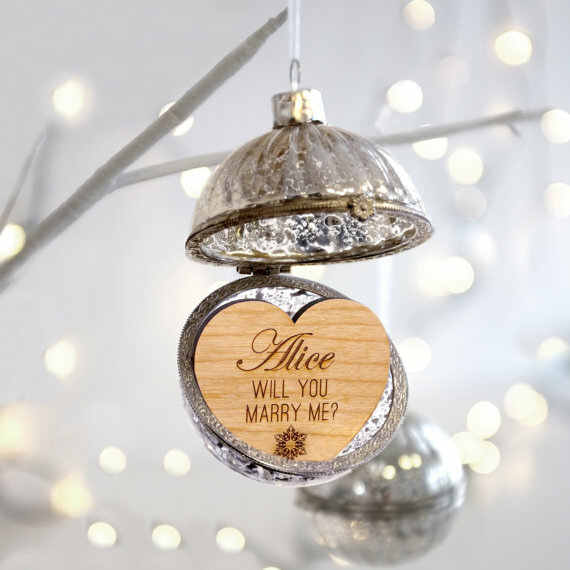 Decorating for the holidays is always so much fun, so make a day out of it and end it off with popping the big question. Set the mood by having Christmas music playing, the fireplace going, maybe even throw some hot chocolate in the mix. If you want to keep your partner guessing and on an adventurous pursuit, then make them go on a scavenger hunt. Make sure to have them go to places that mean something to the both of you. For example, your first date, or where you first said "I Love You". They may eventually catch on to what's happening but won't really know when, this will really get the adrenaline pumping. Travelers at heart? Then why not plan a romantic getaway on a private resort or a weekend getaway in a cozy cabin during the winter. 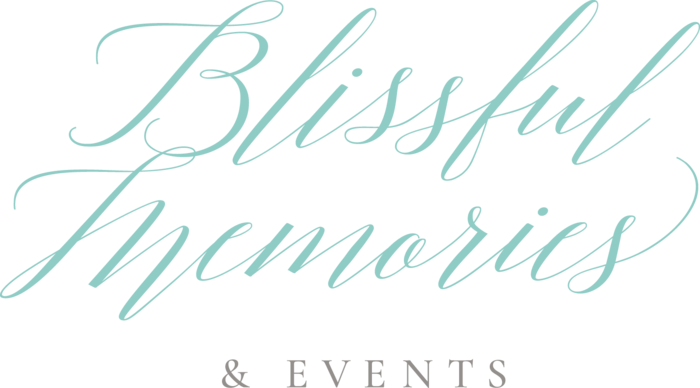 You can organize with a coordinator onsite beforehand, if you want to make it extra special and have the room setup with champagne, roses, chocolates.. the list can go on. If you're both music lovers then proposing at a concert would be so special and meaningful. Whether you do it privately before, during or even after seeing one of your favourite bands or make it a big affair by getting yourself on stage to get down on one knee in front of everyone. Get a group of your closest friends and family or hire professional dancers to take part in a flash mob. Go for a walk in the city or grab a coffee at a local cafe, but on your way there it will be life changing when the people around you start breaking out in a dance then eventually leads to you joining and asking the big question. 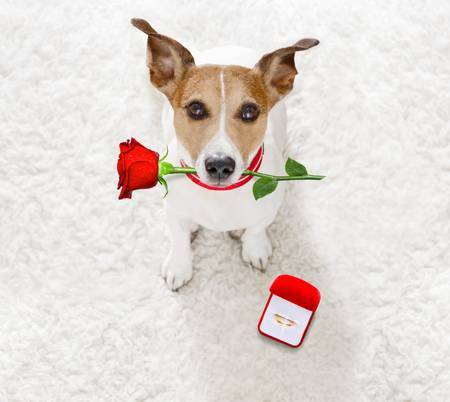 Including your pet in the proposal is always a cute touch. Tie the ring to your dog's collar, or have your cat wear a sign around it's neck asking the question. Who wouldn't say yes to their fur baby? Do you both like solving puzzles? Then why not create a custom crossword puzzle for your partner to solve that reads out "Will You Marry Me?" once it's finished. You can have clues that relate to your relationship for that added touch. Purchase a bunch of helium filled balloons and attach a small gift to each one and then the last one opened can be the ring. You can have the gifts attached to the ribbon or to make it a bit more fun, by placing the gifts inside the balloons and have your partner pop them. You can have an ornament made with the question, or maybe make it a bit more original and include special dates on the ornament. For example, the day you met, your first kiss, your first date and then have the date of when you propose. Once your partner has time to read the dates and maybe clue in, you could be on one knee ready to ask the question. If you both know how to skate, a fun way to propose would be to do it while you're skating. You'll be all cozy in your winter gear, maybe sipping on hot chocolate (or baileys - nobody's judging), holding hands, enjoying the scenery with one another. After a few laps around the rink, you can catch them off guard and pop the question! If you're an adventurous couple, going up in a hot air balloon is the way to go. How romantic would it be to be up in the sky with no care in the world, just admiring your surroundings and then saying yes to the love of your life. If board games are your thing, then why not create a custom board game? For example, with Monopoly you can throw in your own "chance" with the question then pop out the ring once they read it. Bring home your partner's favourite dessert with the big question on the cake. Or maybe they love macarons or cookies. Choose their favourite dessert and have the store package them up nicely and have your partner open them and be ready there with the ring. If you're family oriented or even have kids, then why not include them in the proposal. Have them actually take part in the proposal by holding signs that maybe leads your partner to you holding the ring. Another option is to have them waiting until the proposal happened and have a mini celebration with them later. It's always so fun to celebrate with the ones you love most. If you're not afraid of heights, a fun and exciting idea would be to take a helicopter ride over the city. 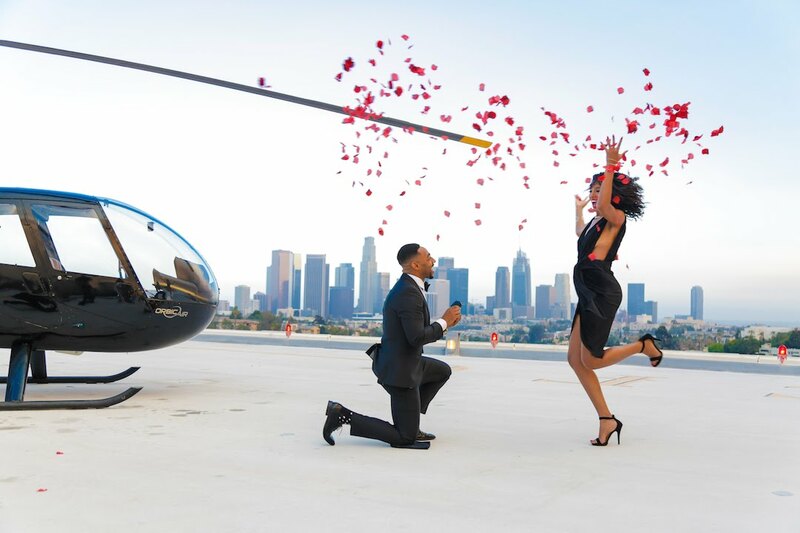 You can choose to propose when you're up in the air enjoying the beautiful landscape or have something planned for when you land. You can even take it to the next level and have writing of some sort, like in a field that reads "Will You Marry Me" so you can only see it from up above. If you are an outdoors couple, why not hike to your favourite lookout point and ask the question when you're taking in the view. You can have a mini setup at the lookout point, so when you arrive you ask the question. Just have a friend (or a wedding planner) set it up before you make your way there. It you're going for an adrenaline rush, then why not jump off a plane and ask the question then. You can choose to do it just before you jump out and then take the leap of faith together, literally, as a newly engaged couple. If you're big sports fan then doing the proposal watching your favourite team could be an amazing option. Take it to the next level and ask the question on the jumbo tron (yes, just like in the movies!). Anything is possible if you plan ahead and get in touch with the right people. Since the holidays are just around the corner what better way to propose then to do it when you're going to pick out a Christmas tree together. Make it even more special by actually going to a tree farm and cut down your own tree. When you find your tree, the timing would be perfect just before you cut it, get down on one knee and take it all in. If you live in the GTA and aren't afraid of heights, then proposing on top of the CN Tower would be perfection. It's already exciting being up above the clouds, looking down at the beautiful city of Toronto, and then you add in a proposal. That would be one spectacular story to tell your family and friends, that's for sure! Tis' the season of holiday lights, carols and hot chocolate. Make your way to the Christmas Market at Distillery District, as it's such a romantic setting to be surrounded by the holiday spirit while you ask the one you love to spend the rest of their life with you. We hope this blog post gives you some inspiration to plan the perfect proposal for the love of your life. However you decide to pop the question, just make sure it's special, as it's a moment you will cherish forever. If you need any help planning the most amazing proposal, get in touch with us as we absolutely love being part of our couples' love story right from the beginning.